The release of OS X Yosemite in 2014 brought with it a complete visual overhaul of the system user interface as a tentpole feature. Alongside the widely anticipated removal of many skeuomorphic elements from Mavericks, in line with the design direction iOS had gone in a year earlier, was the addition of a rather interesting (but slightly overhyped) option in System Preferences to use a dark menu bar and dock. The API for this appearance change had already been laid the previous year in the form of NSAppearance, and some apps took advantage of NSVisualEffectView’s .dark material to provide an appearance that matched that of the system. macOS Mojave has a significantly more extensive version of this behavior that comes “for free” as part of AppKit’s Dark Mode support, but back then apps generally relied on watching for an AppleInterfaceThemeChangedNotification and updating their appearance to match. One feature which was not provided was the ability to change the system theme to match a schedule, allowing for doing things like using Dark Mode at night while picking the light appearance during daytime. I wanted this feature enough that I ended up writing DarkNight, which is sufficiently simple that I wrote it as a launch agent instead of a full-fledged application. It uses some lesser-known private APIs in order to do its job, so I thought it might be interesting to share how it works. We can divide its functionality into two main parts: being able to set the system appearance, and making sure this is done on time. -[AppearanceShared setTheme:] seems interesting: in the decompiled code, we can see that it calls out to the function SLSSetAppearanceThemeLegacy, which it’s getting from /System/Library/PrivateFrameworks/SkyLight.framework. Since SkyLight is part of the graphics subsystem, this is probably what we’re looking for. 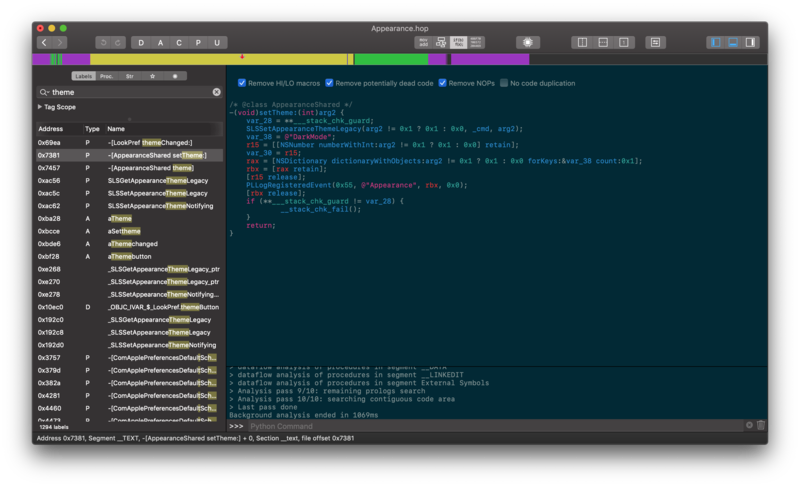 The internal codename for Dark Mode in macOS Mojave appears to have been “Skyglow”. Once of the engineers slips up in when presenting Introducing Dark Mode (which has since been edited), saying the first half of the codename before correcting himself. A quick search through /System/Library for “sky” confirms the actual name. Make sure to pass in -F/System/Library/PrivateFrameworks -framework SkyLight to link against SkyLight.framework; otherwise you’ll get linker errors about not being able to find SLSSetAppearanceThemeLegacy. You may also get something along the lines of ld: warning: text-based stub file /System/Library/PrivateFrameworks/SkyLight.framework/SkyLight.tbd and library file /System/Library/PrivateFrameworks/SkyLight.framework/SkyLight are out of sync. Falling back to library file for linking.–just ignore this; it means that the SkyLight.tbd and the SkyLight binary don’t match or something like that. It isn’t important to our test program. We still don’t know what the parameter means; since it is a BOOL it is likely that YES means one of Light or Dark Mode, while NO is for setting the other value. Fiddling with the program makes it clear that YES corresponds to Dark Mode, and NO will enable Light Mode. DarkNight actually needs to toggle the system appearance, so it needs a way of getting the appearance instead of just setting it. There’s a similar function called SLSGetAppearanceThemeLegacy, also in SkyLight, that takes no parameters and returns a BOOL signifying whether the system is in Dark Mode or not. Now that we have a way to set the system appearance, we need a way to do this at sunrise and sunset. At first glance it looks like we will have to do this ourselves, possibly by finding a web API that does this for us, or by using the computer’s location and a bit of math. But there’s an easier way: macOS is doing this already, because it allows Night Shift to be scheduled based on sunrise and sunset! So we can just turn on Dark Mode whenever Night Shift turns on, and go back to Light Mode when it turns off. Every time Night Shift is toggled, the status should be printed out. Combining all of what we have above, it’s trivial to recreate DarkNight: just change the contents of the block to set Dark Mode instead of printing out the status of Night Shift, e.g. SLSSetAppearanceThemeLegacy(status->enabled). Add a simple launchd property list and you now have a launch agent ready to go. Questions? Comments? Corrections? Feel free to reach out to me at saagar@saagarjha.com; I'd love to hear your thoughts and improve this article!